The Autotrend Channel, MACD and three EMAs Trading System is based on template of Xard777 trend following formed by three moving averages,MACD candles. Time Frame 30 min, 60 min. 200 min. Currency pair:this forex strategy works very well with volatile currency pairs. autotrend channel indicator (set 48 hours for 60 min time frame, set 24 hours for 30 min time frame and set 96 hours for 240 min time frame). Trade only in the direction of the autrend channel indicator. Autrend channel indicator up trend. 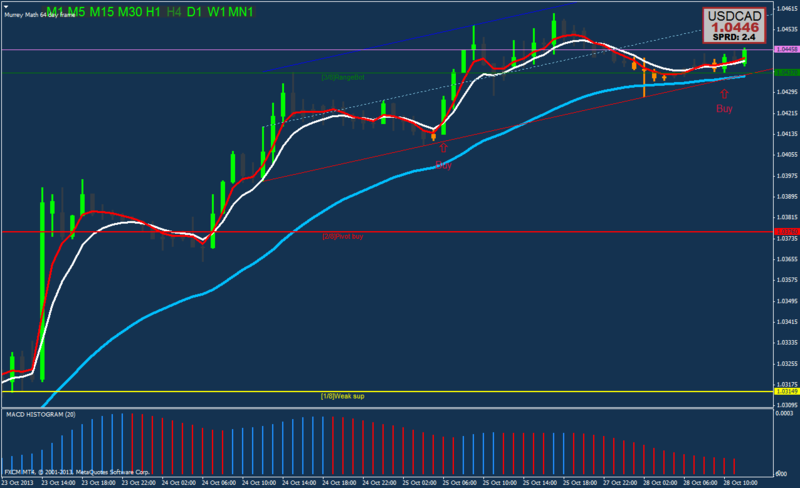 Buy when the 2 moving average crosses above the 6 EMA, and both 2MA and 6EMA cross the 32 EMA in an upward direction. b) The MACD Histogram bar must change colour from red colour to blue colour at the same time that the EMA crosses occur or MACD Candles are green. Autrend channel indicator down trend. Sell when the 2 moving average crosses below the 6 EMA, and both 2MA and 6EMA cross the 32 EMA in an downward direction. b) The MACD Histogram bar must change colour from blue colour to red colour at the same time that the EMA crosses occur or MACD Candles are orange. Initial Stop loss on the previous swing after 15 pips in gain move stop loss at the entry point. Profit target time frame 30 min 12-16 pips, time frame 60 min 15-20 pips, time frame 240 min profit target 40-50 pips. 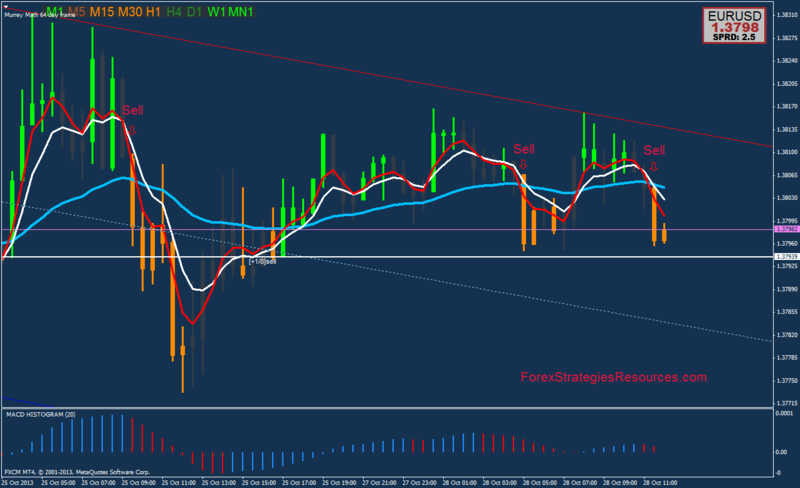 Profit Target (for time frame 60 min or 240 min, also on the Murrey Math lines). 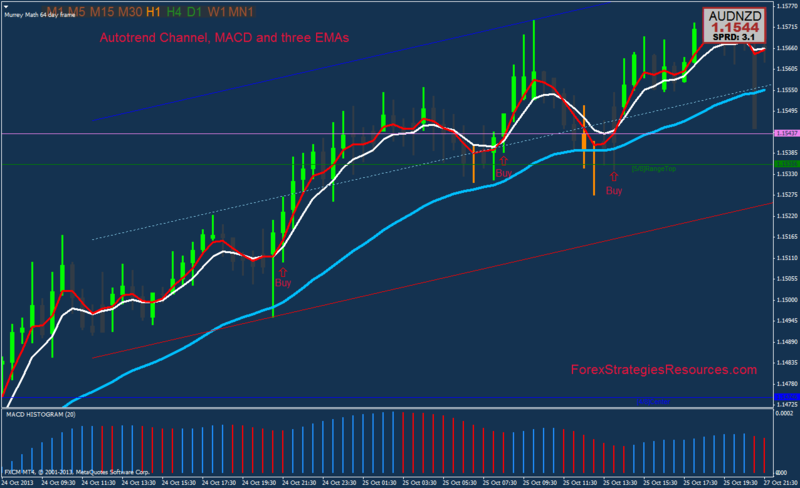 Autotrend Channel, MACD and three EMAs Trading System (Template and indicators).